"The Dead Space experience that people know and love is intact," Dead Space 3 art director art director Ian Milham recently told me and a bunch of other reporters for whom he was demoing next year's sci-fi action game. Isn't that the kind of thing you say only when you're changing a ton of stuff? Sure it is. With Dead Space 3 EA appears to be changing a ton of stuff. What's brand new, aside from this snowy planet Isaac crashes on at the start of the game is co-op. Now you can survive some horror with a friend, and the game will adapt to suit you both. This is indeed a neat trick, as a sequence that involves a player-controlled Isaac arriving at a base on the snow planet to jaw with a soldier named Carver turns, when played in co-op, into a scene in which Isaac and Carver arrive and fight together. What's also new are human enemies and guns in the hands of such enemies. This adds ranged combat to a series that used to only deliver death in close range. Necromorph enemies can now possess the carcasses of human enemies, adding the neat dynamics of the corpse-reviving Flood from Halo to Dead Space 3's combat. The Dead Space fan probably wants to know if these changes rob the game of its horror elements, despite EA's press release promises that this is still a survival horror series. The Dead Space fan might have noticed that co-op made recent Resident Evils less frightening. To that fan I can only say two things: 1) at least in this game the buddy character seems to disappear if you're playing solo and 2) sorry, but it's awfully hard to tell how scary a game is when you're passing a controller around among a bunch of games reporters and the people on the couch 15 feet away who are doing the same thing are hollering boss-defeating strategies at each other. Dead Space 3 played in a party-like situation with the lights on and noisy neighbors? Not scary! The most interesting thing Milham told me about the new game is that this Dead Space is open to exploration. He said players will be able to visit various places on the game's snowy planet and even shoot up to space on occasion. The impression I got was that this game would be less linear than Dead Space 2 and more rewarding to poke around in than the slightly back-trackable Dead Space 1. But is it as scary? Is it still survival horror? Did they just turn this game into a bro-shooter? Hard to say if they made it look more like a co-op shooter because that's what shows as exciting during a show like E3 or because that's how they changed the game. Just remember what the developers said. 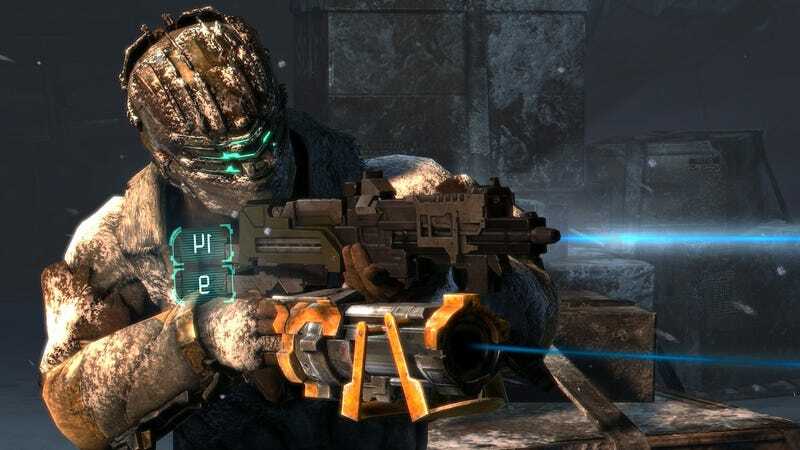 Dead Space 3 is set for release next year on Xbox 360 and PS3.